Multiple scenes of Sherman County, Kansas. The first photograph of the H.H. Auer bakery includes, left to right: Pauline Hartman, Nelle Hartman, Lula Auer, Otto Auer, and Mother Auer. The second photograph of the bakery includes, left to right: H.H. Auer, Carl Frank, Joe Knoppel, and Ed Short. 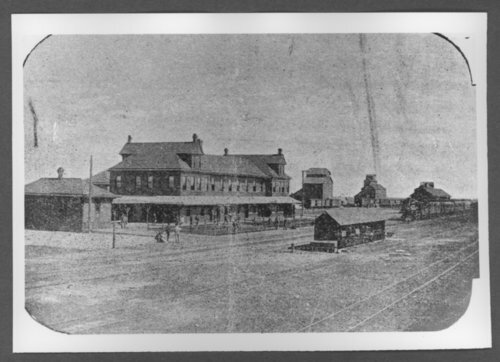 Scenes of Sherman County, Kansas - Rock Island depot and train, Goodland, Kansas, 1890's.